Annual Festivals / Sporting Events in or near Zeerust, Central Region in the North West Province, South Africa. 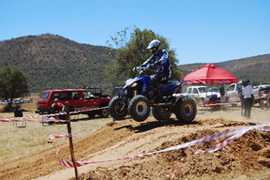 Bosrumoer Festival takes place in the heart of the Bushveld Doornrivier 4x4 Zeerust. Last year we had 4500 visitors through the gates. At Bosrumoer you will relax and recharge your batteries with loads of fun for young and old. You can “stof opskop” in your four-wheel car or quad. Activities include "veldfietsritte", "survivorbaan", Sniper .22 shooting competition, a strong man competition, a baby competition, horse sports, 4x4, Quads & Bikes and Miss Zeerust. One of the highlights is the Diamond Rush where you can sift for the shiny rocks. This year the performing artists is Gerhard Steyn, Snotkop, Pieter Naude, Lizelle Smit, Lollos and Saarkie Rock Band. Wonderful food, lots of stalls and great fun. Everyone is welcome because Bosrumoer comes from the heart, from the forest, from home ​​... and offers genuine farmers hospitality.